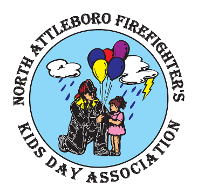 THE NORTH ATTLEBORO FIREFIGHTER'S KID'S DAY ASSOCIATION, IS A NON-PROFIT ORGANIZATION RUN BY THE NORTH ATTLEBORO FIREFIGHTERS, THEIR FAMILIES & FRIENDS. OVER THE COURSE OF THE LAST 30+ YEARS, THEY HAVE RAISED & DONATED TENS OF THOUSANDS OF DOLLARS FOR LOCAL CHARITIES AND CAUSES. THE REASON FOR OUR SUCCESS IS THE HARD WORK OF ALL THE PAST & PRESENT COMMITTEE MEMBERS AS WELL AS THE OVERWHELMING SUPPORT OF THE LOCAL AREA RESIDENTS WHO COME TO OUR EVENT EACH YEAR. YOU, OUR COMMUNITY HAS HELPED IMMENSELY TO BUILD WHAT HAS BECOME A NORTH ATTLEBORO SUMMER TRADITION. OUR RECENT MOVE TO THE NORTH ATTLEBORO HIGH SCHOOL/MIDDLE SCHOOL HAS OPENED THE DOOR FOR US TO CONTINUE TO GROW & KEEP THE TRADITION ALIVE AND WELL. JULY IS RAPIDLY APPROACHING & THE COMMITTEE IS HARD AT WORK PLANNING FOR ANOTHER GREAT YEAR. MARK YOUR CALeNDaRS FOR JULY 25-28 BECAUSE YOU'RE NOT GOING TO WANT TO MISS OUT ON SOME GREAT FUN! !